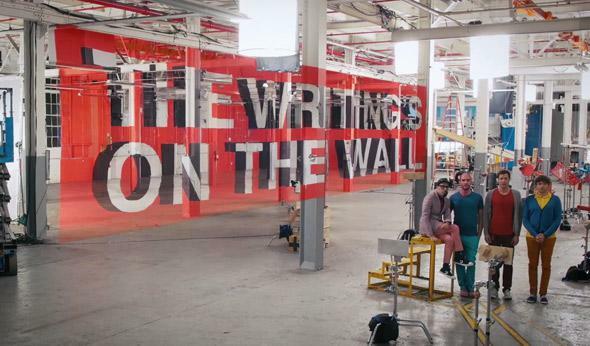 OK Go video: Illusions fill "The Writing's on the Wall." … and on the I-beams and the floor. The alt-rock band OK Go is known for their innovative videos. You’ve probably seen the one with them on treadmills; it’s pretty enjoyable. A. Mazing. It looks like it’s done in one take (though it took a lot of takes to get to it), which is very cool indeed. I’ve seen most of these types of illusions before (some were done in a recent Honda car commercial) but that doesn’t matter; it’s the way they’re put together here that’s so astonishing. I was really happy to see one of my favorite Necker Cube illusions at the 1:40 mark, too. What I also like is how the overall theme matches the lyrics, dealing with two people misunderstanding each other. That’s one of the big points about illusions, after all: What you think you’re seeing may not be what’s really going on. We shouldn’t necessarily trust what we think we’ve seen or heard when it comes to objective reality, or when dealing with other people. Really listening and observing are a big part of really understanding.